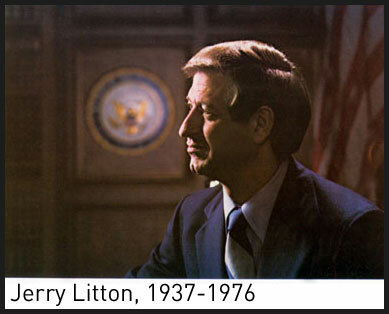 The Jerry Litton Family Memorial Foundation was created in 1976 after the tragic passing of Jerry, his wife, and their two children. 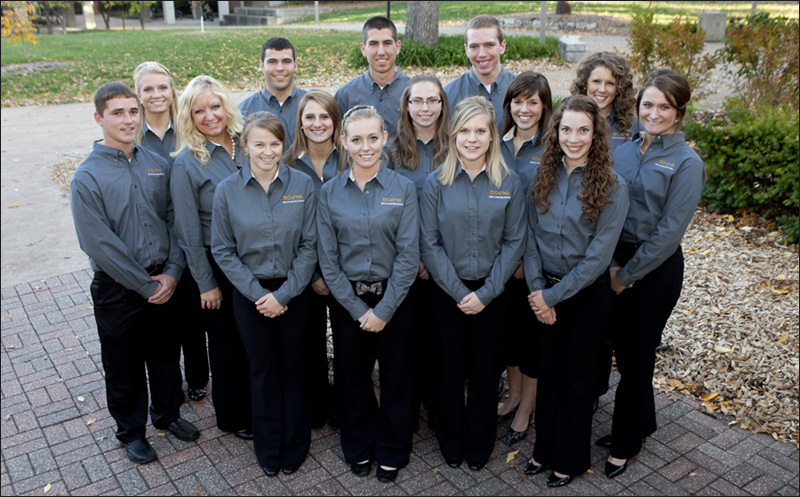 Over the years the Foundation has supported the development of future leaders in the agricultural industry and beyond. 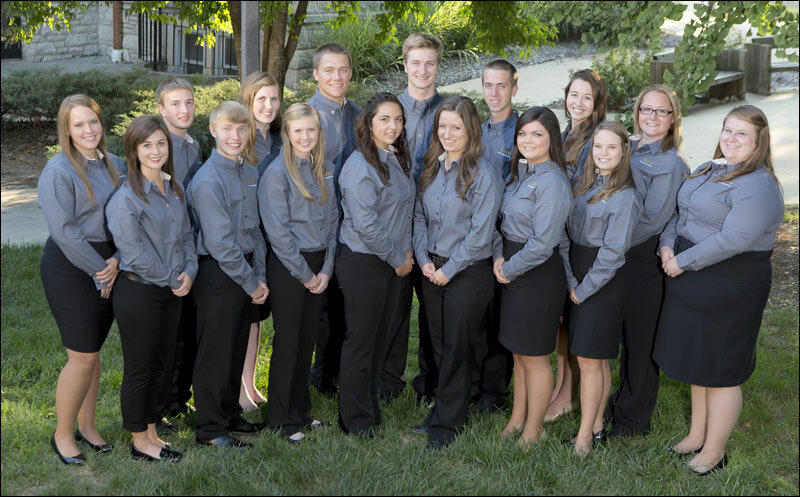 The College of Agriculture, Food and Natural Resources at the University of Missouri is honored to continue the Foundation’s mission through the Litton Leadership Scholars Program. Each year, deserving students are selected to become part of a year-long leadership development experience that will challenge them to not only lead while on campus but in their future career fields. Students chosen will be met with a tremendous opportunity for growth and a responsibility to be productive citizens in the future. The Litton Leadership Scholars Program focuses on developing the whole student to successfully navigate today’s challenges and tomorrow’s uncertainty. It is an honor to be a Litton Leadership Scholar and with the honor comes an expectation of high achievement. Each cohort of Litton Leadership Scholars (LLS) will engage in a uniquely designed seminar course that capitalizes on the best that leadership education has to offer. Scholars will interact with leadership, agriculture, and community experts. The academic and relational nature of the experience guides the Scholars to become impactful change agents in the University of Missouri community and beyond. Hold a 3.0 minimum G.P.A. when entering the cohort. Application is due Friday, March 1, 2019, by 5 p.m., to the CAFNR Office of Academic Programs (2-64 Ag Bldg). Front Row (L to R): Jacob Blank, Agricultural Education and Leadership, Richland; Jillian Klein, Agriculture, Wildwood; Quinn Dubinski, Agricultural Education and Leadership, Columbia; Katelyn Elder, Agricultural Education and Leadership, Urbana; Allison Abadir, Agricultural Education and Leadership, Columbia; Emily Blaue Agricultural Education and Leadership, Wellsville; Abigail Bertz, Agribusiness Management, Mayview. Middle Row: Sydnee Mason, Agricultural Education and Leadership, Marshall; Adam Fisher, Environmental Science and Philosophy, Wentzville; Garren Powell, Biochemistry, Hughesville; Samuel Stoll, Mechanical Engineering, Festus; Seth Gibson, Parks, Recreation and Sport, Norborne; Dillon Linneman, Agribusiness Management, Carrollton. Back Row: Zachary Trout, Agricultural Systems Management, Chillicothe; Aaron Mott, Agricultural Education and Leadership, Rocheport; Dylan Boling, Agribusiness Management, Clarence; Ben Luebbering, Agribusiness Management, St. Thomas; Justin Belew, Agriculture, Hartsburg; Abby Turner, Agricultural Education and Leadership, Brookfield; Emma Leamer, Agribusiness Management, Chillicothe. Front Row (L to R): Sara Gholson, Animal Science, Jackson; Natalie Ayers, Science & Agricultural Journalism, Green City; Lily Grant, Agricultural Education & Leadership, Columbia; Jacqueline Janorschke, Science & Agricultural Journalism, Saint Joseph; Bryce Fifer, Agribusiness Management, Shelbina; Baileigh Horstmeier, Agricultural Education & Leadership, Fulton; Blayre Messner, Agribusiness Management, Albany; Holly Harlan, Biochemistry, Salisbury; Clarke Blodgett, Agribusiness Management, Macon; Derrek Hardy, Agricultural Education & Leadership, Browning; and Emily Milazzo, Agricultural Education & Leadership, Galt. Back Row (L to R): Lane Bonderer, Agribusiness Management, Chillicothe; Chad Adler, Political Science & German Language, Lake Saint Louis; Caleb Quinlan, Plant Science, Mexico; Stuart Allen, Biochemistry, Lebanon; D. Cole Diggins, Environmental Science, Bronaugh; Ben Schnelle, Agribusiness Management, Lockwood; J. Clayton Robinson, Agribusiness Management, Center; Jacob Bockting, Agricultural Economics, Hermann; Colton Spencer, Agricultural Education & Leadership, Aurora; Logan Korff, Agricultural Systems Management, Norborne; and Holly Enowski, Science & Agricultural Journalism, Eldon. Front Row (L to R): Lauren Haley, Agricultural Education & Leadership, Chillicothe; Sylvia Romine, Agricultural Education & Leadership, Centralia; Alexa Nordwald, Science & Agricultural Journalism, East Prairie; Skylar Townsend, Agricultural Economics and Accounting; Hannah Boatright, Plant Science, Sedalia; Madison Byrd, Science & Agricultural Journalism, Keytesville; Lacy Fitzpatrick, Agricultural Education & Leadership, Eldon; Brandelyn Martin, Science & Agricultural Journalism, Silex; Katie Gowdy, Biochemistry, Ashland; and Carlee Johnson, Agribusiness Management, Laredo. 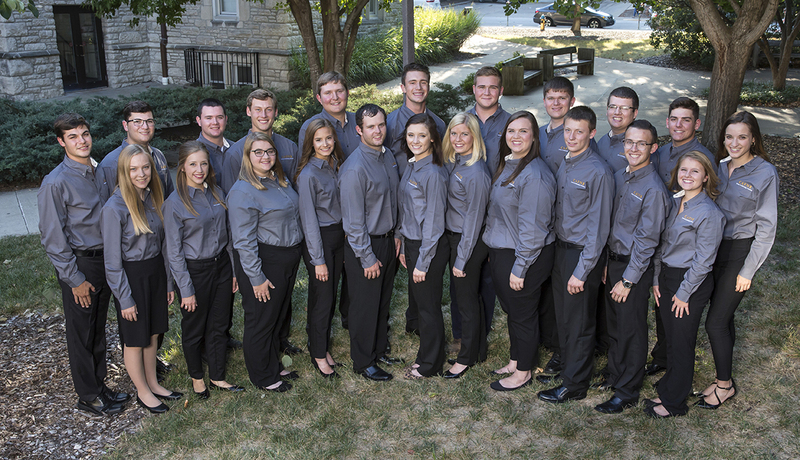 Back Row (L to R): Matt Oerly, Animal Science, California; Kelsey Batson, Animal Science, Princeton; Andy Mott, Agricultural Education & Leadership, Columbia; Robert Schmidt, Biochemistry, Columbia; Adam Kirby, Agribusiness Management, Trenton; Dane Brammer, Agricultural Economics and Plant Science, Gallatin; Brett Mason, Agricultural Systems Management and Agribusiness Management, Paris; Abigail Hoer, Agricultural Education & Leadership, Mexico; Maria Kuhns, Agribusiness Management, Mason, IL; and Alex Stichnote, Agribusiness Management, Ashland. Front Row (L to R): Victoria Lock, Science & Agricultural Journalism, Carrollton; Yia Yang, Plant Science, Wheaton; Samantha Marre, Agricultural Education & Leadership, Elsberry; Libby Martin, Animal Science, California; Savannah Taylor, Agricultural Education & Leadership, Milan; Jennifer Zulovich, Biochemistry, Columbia; and Cavin Joesting, Agriculture, Tarkio. Middle Row (L to R): Kaitlin Epperson, Animal Science, Columbia; Katelyn Stoops, Agribusiness Management, Summersville; Rachael Bonacker, Animal Science Pre-Vet, Cedar Hill; Katy Stoecklein, Animal Science, Macon; Jaime Luke, Agricultural Economics, Stanberry; Maddie Grant, Animal Science, Columbia; Mason Sandidge, Agriculture, Marshall; Rebecca Helton, Hospitality Management, Macon; and Taylor Strain, Agricultural Education & Leadership, Rolla. 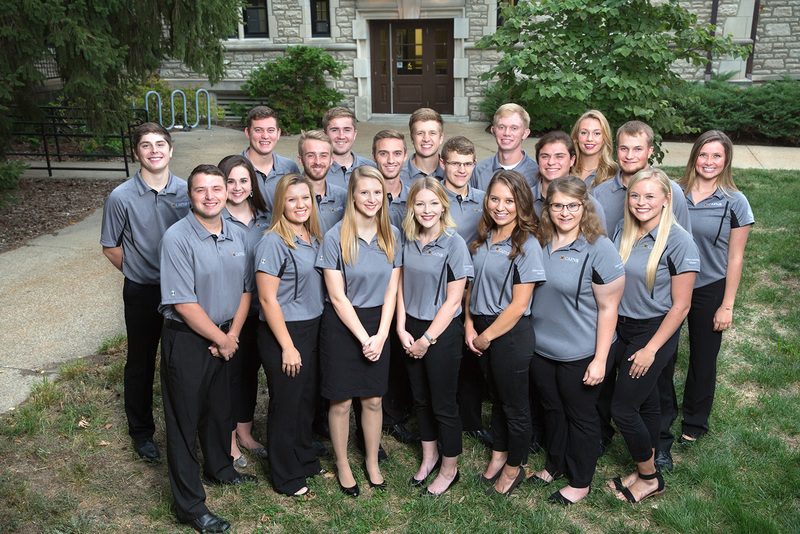 Back Row (L to R): Ethan Fordyce, Agricultural Systems Management, Bethany; Jack McCleave, Agricultural Economics, Harrisonville; Matt Schroer, Agribusiness Management, Troy; Cole Edwards, Agribusiness Management, Salisbury; Michael Carpenter, Agricultural Systems Management, Hardin; Carley Esser, Agricultural Education & Leadership, Boonville; and Clara Knipp, Agricultural Education & Leadership, Tipton. 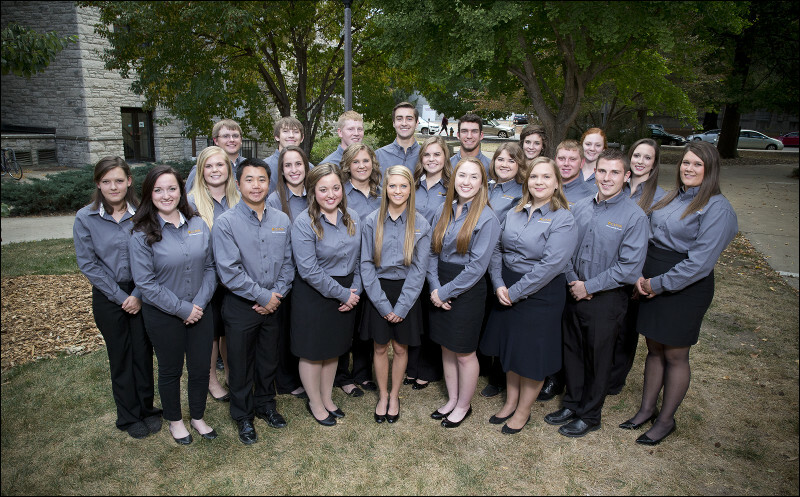 Front Row (L to R): Abrea Mizer, Biochemistry and Agricultural Education & Leadership, Marshall; Tanner Adkins, Plant Science, Elmo; Kendra Stinson, Animal Science and Agribusiness Management, Prairie Home; Maria Raquel Juarez, Animal Science, Blue Springs; Miriam Martin, Animal Science, Meadville; Haley Alden, Agribusiness Management, Hamilton; and Samantha Coulson, Agricultural Education & Leadership, Green City. 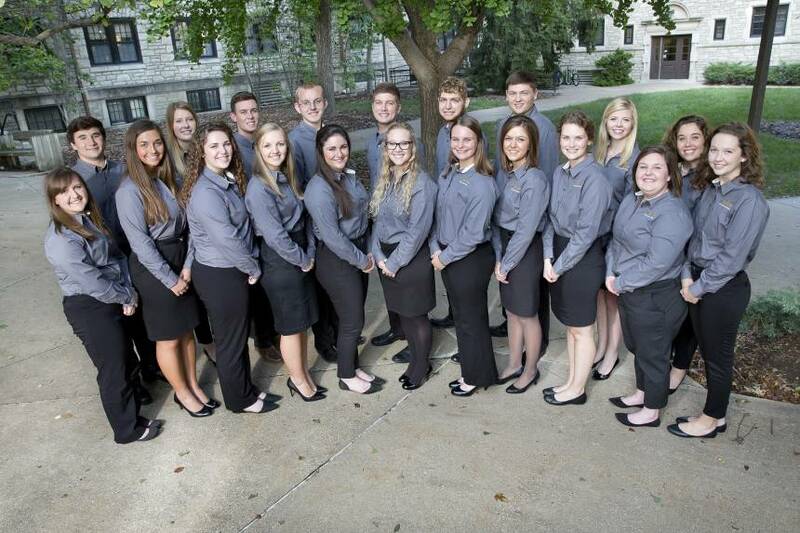 Back Row (L to R): Alexandria Berghaus, Plant Science, Farmington; Grant Voelker, Agricultural Education & Leadership, Perryville; Tessa Chambers, Science & Agricultural Journalism, Fayette; Phillip Cooley, Agribusiness Management, St. Charles; Nicholas Pirotte, Agribusiness Management, Prairie Village, KS; Sam McDonald, Plant Science, Silex; Maria Kalaitzandonakes, Agricultural Economics and Science & Agricultural Journalism, Columbia; Sayde Heckman, Plant Science and Agricultural Education & Leadership, Ashland; and Caitlin Stanek, Agricultural Education & Leadership, Troy. Front Row (L to R): Payton Ehrhardt, Science & Agricultural Journalism, Marshall; Morgan Beach, Agricultural Economics, Pilot Grove; Brittany Elliott, Animal Science Pre-Vet, Fayette; Heyley Heupel, Agribusiness Management, Granby; Courtney Spencer, Animal Science, Aurora; and Emily Brookshire, Agricultural Education & Leadership, Jefferson City. Middle Row (L to R): Haley Thompson, Agribusiness Management, Ludlow; Jaelyn Bergmann, Agricultural Education & Leadership, Paris; Taylor Fredrick, Agricultural Education & Leadership, Columbia; Sonja Perry, Animal Science, Bowling Green; Samantha Browning, Biochemistry, Hallsville; and Amanda Smith, Agricultural Education & Leadership, Rolla. Back Row (L to R): Kirby Fecht, Agricultural Economics, Carthage, IL; Corey Hudson, Agricultural Education & Leadership, Middletown; Dustin Oehl, Agricultural Education & Leadership and Agribusiness Management, Friedheim; Eric Renne, Biochemistry, Wentzville; William Inglish, Agribusiness Management, California; and Sidney Schenkel, Agribusiness Management, Maryville. Front Row (L to R): Kelsie Lovelace, Animal Science, Palmyra; Maggie Hardwick, Science & Agricultural Journalism, Salisbury; Natoshia Minor, Agribusiness Management, Butler; Kaitlin Flick, Plant Science, Pleasant Hill. 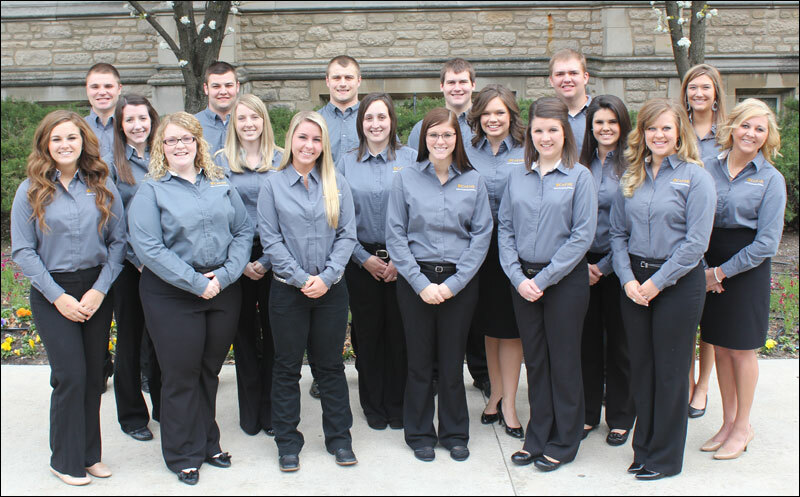 Middle Row (L to R): Kent Shikles, Agricultural Education & Leadership; Breanne Brammer, Science & Agricultural Journalism, Gallatin; Jenny Gann, Agribusiness Management, St. Joseph; Courtney Leeper, Science & Agricultural Journalism, Trenton; Clarissa Brown, Agricultural Education and Leadership, Troy; Shannon Yokley, Science & Agricultural Journalism, Jefferson City. Back Row (L to R): Monica Campen, Agricultural Education & Leadership, Canton; Cody Jones, Agribusiness Management, Fulton; Daniel Bonacker, Agricultural Systems Management, Cedar Hill; Kevin Reininger, Biochemistry, Flint Hill; Aubrey Ellison, Science & Agricultural Journalism, Mt. Vernon.